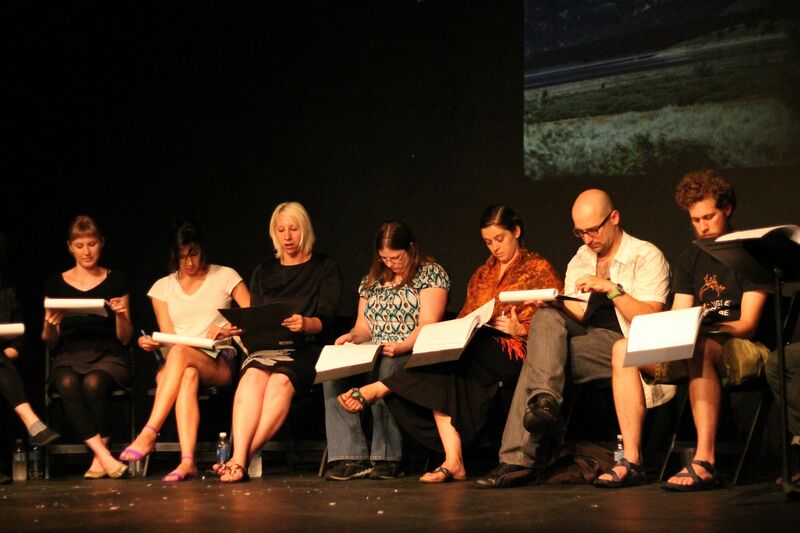 This is the course blog for Auteur 101: Short Film Laboratory, a 2013 summer course at Johns Hopkins, in the Film and Media Studies department. The student filmmakers are Alena Flick, Abby Francis, Frank Lukaitis, Tiffany Kim, and Catherine Wityk; the instructors are Jimmy Roche and Dara Weinberg, and the TA is Josh Land. 2013 “Auteur 101” students also created slide projections for a reading at Single Carrot Theater in Artscape, under the guidance of Baltimore filmmaker Meg Rorison. “Auteur 101” student slides projected behind actors. The 2013 “Auteur 101” students will also create a projection design for a performance based on Robert Frost’s poetry, under the guidance of Baltimore filmmaker Monica Lopez-Gonzalez. This performance, “Home Burial,” will take place on the Homewood House Museum on the JHU campus. Thursday, August 1st, at 5:30 PM. Free but reservations required; admission is extremely limited. Call 410-516-5589. 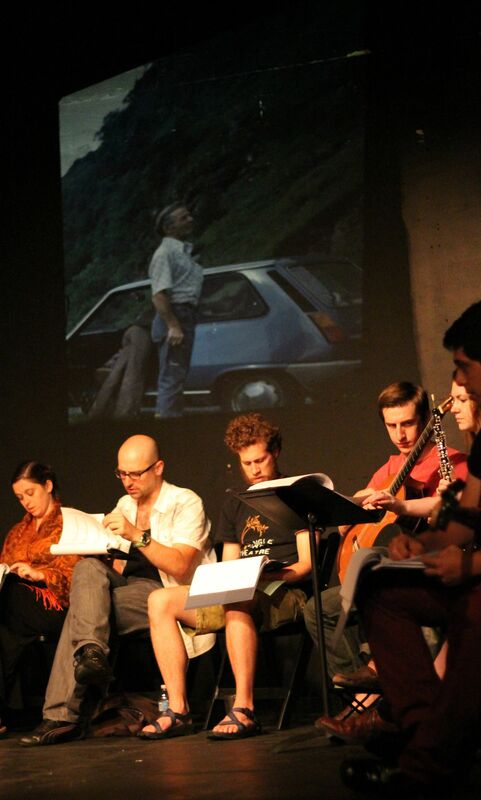 More “Auteur 101” student slides with actors at Artscape. This is the course blog for Auteur 101: Short Film Laboratory, a 2012 summer course at Johns Hopkins, in the Film and Media Studies department. The student filmmakers are Hala Algrain, Samantha Choos, Aidan Fisher, Adhiraj Goel, Juan Negrette, Alexandra Nemetschke, and Daniel Rose; the instructors are Daniel Schwartz and Dara Weinberg. 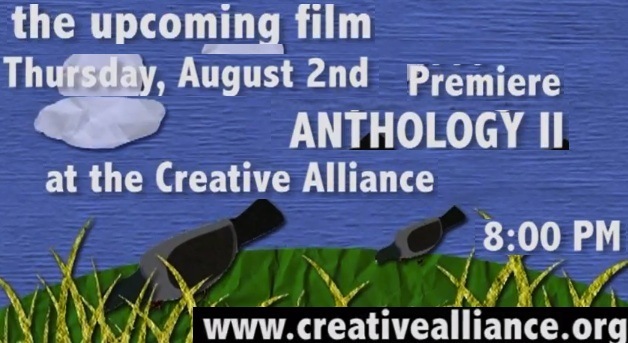 Short films created in the course will screen alongside films by local and unlocal filmmakers at the Creative Alliance on August 2nd, 2012, as part of the ANTHOLOGY II film compilation, produced by the Parallel Octave Chorus. This screening made possible through the generous support of the following Johns Hopkins departments and offices: Film and Media Studies, Summer Programs at JHU, Writing Seminars, the JHU Libraries, and the Brown Foundation Digital Media Center.